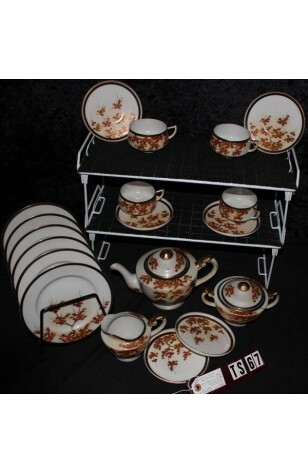 Vintage - Kutani CPO Bone China Tea Set in the KUT139 Pattern, Hand Painted, 21-Piece Set, Circa 1946-1952. This Hand Painted Kutani China Tea Set for Four (plus spare Saucers & Tea Plates) in the KUT139 Pattern. This is a China that was made to Sell in the U.S. Military Bases, from 1946 to 1952. (per CPO Back Stamp). Pattern is of a Golden Tree with Red Enameled Leaves, Decorative 22kt Gold Band and 22kt Gold Rims, Handles and Lid Knobs. A very Thin China, but not Quite Eggshell. No Chips, Cracks or Crazing.. Really good condition. This Hand Painted Kutani China Tea Set for Four (plus spare Saucers & Tea Plates) in the KUT139 Pattern. This is a China that was made to Sell in the U.S. Military Bases, from 1946 to 1952. (per CPO Back Stamp). Pattern is of a Golden Tree with Red Enameled Leaves, Decorative 22kt Gold Band and 22kt Gold Rims, Handles and Lid Knobs. A very Thin China, but not Quite Eggshell. No Chips, Cracks or Crazing.. Really Good Resale Condition unless noted below or in pictures. 6 - Saucers - 5 1/4"